Just what is clicker training? Many dogs owners are hearing about this “new” style of positive-reinforcement training, and it’s become the training style of choice for most puppy classes, but few really know what it’s all about. Clicker training is all the rage in positive reinforcement dog training circles. 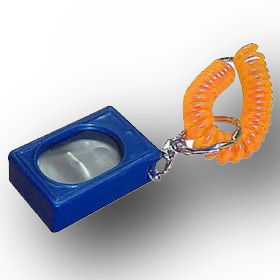 A clicker for training dogs is simply a noisemaker that emits a very distinctive clicking sound when pressed. Formerly party favors at children’s birthday parties, these noisemakers made their way into the animal behavior field in the ’60s and ’70s when correction-based training methods were losing favor with large animal trainers. Hollywood animal actor trainers and marine mammal trainers began to use the devices to “mark” or identify a correct behavior for undomesticated animals like ravens, tigers, and sea lions. The concept behind clicker training is simple: a clicker tells the animal “That’s right!” more effectively and efficiently than we can with our voices. The click is different from other common sounds, and easily recognized by animals. When a click is followed by a reward (like a fish for a dolphin or a cookie for a dog), the animal learns very quickly that a click is a good thing, and begins to try to pinpoint what behavior earned the click/reward. Initially, clickers were used because they work at a distance, and whereas you could pet a dog or a cat to communicate your pleasure at a job well done, it’s harder to give a dolphin a pat at the exact moment he’s launched into a back flip. However, as large animal trainers were able to train ever more complex behaviors, dog trainers began to experiment with using clickers in obedience training, leading to a complete shift in dog training methodology – away from purely punitive practices to positive-reinforcement training methods. Clicker training works great when dogs are learning new behaviors, because it tells them exactly when they are engaging in the right behavior. Dogs only have about 1.6 seconds to match a behavior with a consequence (as in, “Oh! Sitting gets me a cookie!”), so teaching new behaviors can be challenging. If you don’t “mark” the behavior fast enough, the dog may think that he is being rewarded for sniffing the floor, for example, and not for lying down. Clicker training drastically speeds up the learning process by giving your dog precise feedback. Clicker training puppies is particularly helpful, and likewise for small, jumpy dogs. Clicking for a calm behavior (like sitting still, even for a second) is often just the thing these wigglers need to figure out what to do with their bouncy rears. Many dog owners prefer clickers because clicker training puppies can be a lot of fun for both owner and the new puppy. If you’re going to hire a dog trainer to help you, look for one who practices positive reinforcement training. Reward-based training is the perfect way to provide a good start to your new relationship with your puppy. However, even adult dogs respond happily to positive training, and if owners have problems using a clicker for dog training, they can easily substitute a short, clear word like “Yes!” instead of using the clicker. Although clicker training usually takes a bit longer and requires more of an owner commitment to training than punishment-based methods, owners develop a deeper connection with their dog. Your ability to understand your dog will become far greater with positive reinforcement training than any other method. Positive reinforcement training – the concept behind clicker training – differs from more traditional dog training because punishment is not involved. The dog is simply not rewarded for undesirable behaviors. So, whereas in correction-based training methods, a dog may have receive a leash correction or tug for pulling, in clicker training, the dog is clicked and rewarded when they are in the correct position – next to your leg. The dog simply receives no reward when away from your leg, or when pulling on the leash. The dog then learns that the heel position is a desirable place to be, and gradually the training is worked up from just a few steps to a fully-trained behavior. Clickers can also be used to treat complex behavior problems, by using incremental steps to alter undesirable behaviors. For example, in the case of wild and impulsive dogs, clicker training can teach calm behavior in the face of arousing distractions. Rather than asking the dog to go from completely out-of-control to a suppressed calm, a clicker is used to teach the dog that calmer behavior results in rewards. Additionally, the use of the clicker removes some of the frustration from the owner that might be communicated to the dog through an angry tone of voice (which some dogs find arousing in and of itself). At first, the owner just asks for a small change, like no barking, and gradually rewards calmer body language. Bit by bit, the criteria for the click is raised so that the dog eventually learns how to control his impulses, which results in a complete personality shift for many who have tried this method. Get a clicker. A clicker for dog training is sometimes available in local pet stores, and a wide assortment are available online. “Load the Clicker.” Teach your dog that click = reward. Stand in front of him, click and give him a treat. Do this about twenty times in rapid succession so that he begins to associate the sound of the click with the reward. This needs to be done only once. Start clicking! If you want to train your dog to sit using a clicker, hold the treat just over his head and move it backwards towards his rear until, like a fulcrum, he’ll raise his head up and lower his rear. The second his rear is on the ground, click and treat. Get creative. Clickers can also be used to capture “found” behaviors and put them on cue, meaning you can train tricks using things your dog already does. Want to teach your dog to scratch on command? Be ready with a clicker and wait until he does, then click and treat. Any behavior that is consistently rewarded will be repeated. The possibilities are endless! Learn more about positive reinforcement dog training at the Zoom Room. Love Clicker training, works wonders with cats as well! You’re absolutely right. Clicker training is great for cats. And dolphins. And in some cases, we’re told, even husbands!